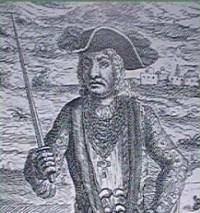 Bartholomew "Black Bart" Roberts, was one of the most successful and menacing pirates in the Golden Age of piracy. He had a brief career (less than four years), yet he captured a mind staggering total of more than 400 ships. Born John Roberts he became Bartholomew Roberts in June of 1719 when the ship he was third mate on was captured off Ghana by Howell Davis, another great pirate of the era. Roberts had been engaged in purchasing slaves for the Royal Africa Company. Upon his capture, he was forced to join Davis' crew. About a month later Davis was ambushed and killed by the governor of Principe Island. In his short time on the pirate ship Roberts proved his competency and superiority, so the crew elected him Howell's successor. Roberts stated, "It is better to be a commander than a common man, since I have dipped my hands in muddy water and must be a pirate." Henceforth he became known as "Black Bart" and sailed the seas looting wherever he went. Roberts sailed for Brazil during which time he captured a Dutch ship and burned an English slave ship. In September he encountered a convoy of 42 Portuguese traders escorted by two 70 gun warships. Roberts attacked and captured a larger, more powerful ship which had £30,000 in gold coins. While Roberts was in a captured sloop, Walter Kennedy, who had been left in command, stole both the prize and the ship the "Rover." Roberts renamed the 10 gun sloop he had taken the "Fortune." He plundered 4 small ships and evaded a British ship sent in pursuit. In June 1720, Roberts wreaked havoc along the Newfoundland coast capturing 26 sloops and 150 fishing boats, as well as destroying sheds and machinery along the shore. Roberts seized an 18 gun galley and traded her for a 28 gun French ship, renaming her the "Royal Fortune." Roberts sailed south and plundered at least a dozen English merchantmen. Roberts is reputed to have tortured and killed French prisoners. In September 1720, Roberts reached the West Indies where he attacked the harbor at Saint Kitts. He seized one ship and burned two others. Roberts sailed out of the harbor only to return the next day, whereby he was driven away by cannon fire. Roberts repaired his ships at Saint Bartholomew, then, in October he returned to Saint Kitts to attack. Roberts plundered 15 French and English ships there. By January 1721, Roberts had added a 32 gun Dutch slaver which he used to trick the inhabitants of Martinique. Roberts sailed the ship past the harbors of Martinique signaling the Frenchmen to visit Saint Lucia, telling them of a profit to be made buying slaves there. Roberts waited for his prey at Saint Lucia and seized and destroyed 14 French ships. The French prisoners were severely tortured and some were killed. The "Fortune" was replaced by an 18 gun brigantine renamed the "Good Fortune." Roberts next captured a French man-of-war which had as one of her passengers the governor of Martinique . The governor was hanged and the ship which sported 52 guns was renamed the "Royal Fortune." Roberts had at this time 3 ships in his fleet, the "Fortune", "Good Fortune", and the "Royal Fortune." Roberts had nearly single-handedly halted shipping to and from the Spanish Main, having lasted over a year in the Navy infested waters of the Caribbean . At this time he returned across the Atlantic to sell his stolen wares, and to plunder the African coast. By April 1721, Roberts had become more tyrannical over his crew. On the way to Africa the "Good Fortune" was stolen by Thomas Anstis who had been given command of her. In June, Roberts arrived at Africa where he captured 4 ships keeping one and renaming her, the "Ranger". Roberts then sailed to Liberia where he captured the Royal Africa Company's ship the "Onslow". The ship had cargo worth £9,000 and it replaced his ship the "Royal Fortune". His next stop was the Ivory Coast where he took at least 6 prizes. January 11th, 1722 , Roberts reached Whydah and captured 11 slave ships which were ransomed for 8 pounds of gold dust each. When one of the captains refused to pay, his ship was burned along with it's cargo of 80 slaves. By now he had added another ship, a 32 gun French warship renamed the "Great Ranger". Roberts had become a serious threat to the British trading companies and as such, many pirate hunters were pursuing him. On February 5th, a British man-of-war, the "Swallow" captained by Challoner Ogle caught up with Roberts near Cape Lopez in Gabon . Some say Roberts mistook the "Swallow" as a Portuguese trader and closed to fight her. Others say Ogle found the "Royal Fortune" at anchor with most of Roberts' crew drunk or hung over after celebrating the taking of a prize the previous night. And Roberts took the "Royal Fortune" toward the "Swallow" hoping to escape with the help of the wind. In either case once in range Ogle sent a bombardment of cannon fire to the pirates and immediately Roberts' men responded in kind. When the smoke cleared, the crew saw that Bartholomew Roberts was slumped over a cannon and had been killed in the first and only barrage. The crew showing loyalty towards Roberts, threw his body overboard rather than letting it fall into the hands of the British. With a devastated morale, the pirates attempted to flee, but they were overtaken easily. Because their mizzen topmast had been damaged, they sailed ineffectively. Roberts' crew soon surrendered. The crew were taken prisoner and tried at Cape Coast in Ghana . Of these 74 were acquitted, 70 black pirates were returned to slavery, 54 pirates were hanged, and 37 received lesser sentences. Shortly after this incident, piracy almost completely died out. The names of men like Roberts reached immortality even if their lives were short, and although piracy would flare up every now and then it never again reached the intensity of this Golden Age of Piracy.